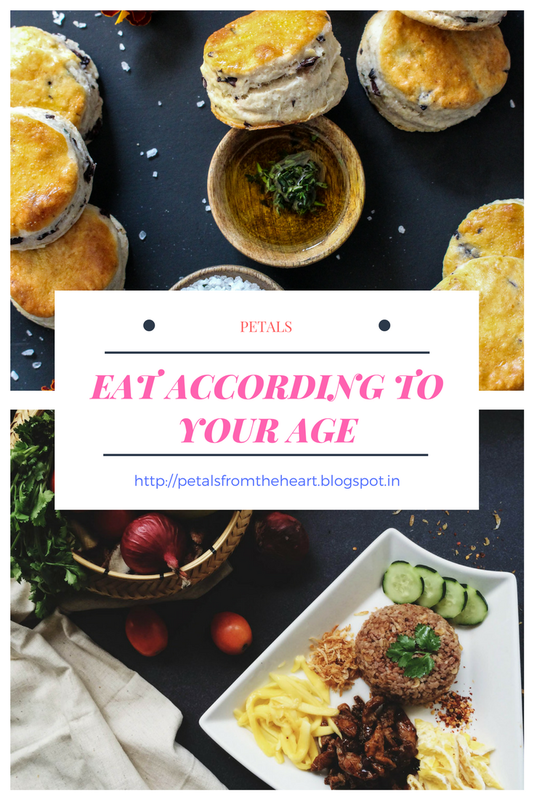 Experts say that as years roll by, your body’s ability to absorb nutrients decline, so it is even more important to formulate a balanced diet and eat according to one’s age. The following age-specific information (excluding the details given under ‘Expectant Mothers’) is a summary from an article I read in the popular UK food magazine called Delicious and the article is titled “Eat your age: Wise up to your changing needs.” It is written by Anna Montague and published in March 2011. Iron deficiency is seen as a predominant condition in most teenage girls and this trend is increasing. Teenage girls are not getting enough iron from their diet. Having a daily sufficient calcium intake is important for girls as it is like having ‘bone in the bank’ for the future. It is important for expectant mothers to maintain a proper balanced diet. High levels of caffeine can lead to low birth weight or even miscarriage. Women who are pregnant need to have folate-rich food besides 400 mcg folic acid supplement daily to reduce the risk having a baby with neural tube defects such as spina bfida. In South India, it is recommended that having coconut water thrice a day is highly recommended as both mother and baby will be replenished with natural vitamins from nature. Also, most mothers who have tried this method vouch for babies with smooth, glowing skin. Customary practice is that expectant mothers can have warm milk with saffron. My gynaecologist advised me it is not good for the baby because saffron has a ‘drugging, sedative effect’ which is not good for a baby’s developing brain. So, I didn’t touch it. As you grow older, it becomes more important to stay fit and healthy. Have plenty of calcium-rich foods for your bones as a woman’s body at this age produces less oestrogen and therefore, bone loss also accelerates. Bask in the sunshine. Your body needs vitamin D to absorb calcium effectively. Sunlight on the skin is a main source of vitamin D.
Salt intake should be carefully monitored. Fibre rich foods like oats, beans, pulses and lentils can help reduce blood cholesterol levels. Thanks for sharing it. Also right exercising is as important. very useful for a health & fitness freak like me!! Thanks Harish. As you rightly mentioned, exercise is important for good health and keeping fit. Raji, I am glad you liked the post.